A post on this theme from five years ago caught my eye, so I thought I’d offer a re-write. There are always reasons to quit. This is true in anything you might pursue. Sport, music, hobby, fitness, work, ministry, marriage. Anyone who has ever been successful at anything has had to overcome numerous opportunities to quit. How true is that in preaching? There are few things that can compare with preaching – how important it is, how much people need it, how much you give both in preparation and presentation, how emotionally and physically draining it can be, how open to criticism you become, how relentless the schedule can feel, how exacting the standards are in peoples’ minds for every other area of your life. To give the Lord our best as preachers we must exhibit a tenacious relentlessness. The temptation to quit may always be lingering in the background, but for various reasons, good and bad, many of us would not simply quit. Perhaps it’s a little like marriage among some Christians a couple of generations back. A marriage could go very sour, but divorce was considered so inappropriate that couples would live out a “Christian divorce” – two separate lives lived under one roof for the sake of appearance. That’s a danger for us as preachers. When the pressures build, as they do so regularly, so do the temptations. 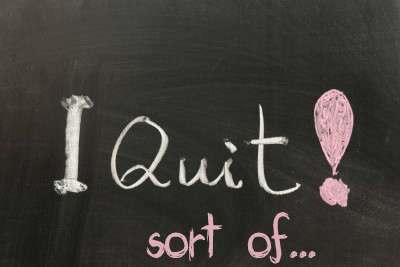 Temptations to quit may be rejected. But temptations to half quit are an ever present danger! When the schedule is tight and you are drained emotionally and physically, pulled in numerous directions, don’t half quit on your preparation. It may seem tempting to not really study the text, to short-circuit all exegesis. When Sunday is rapidly approaching and your energy is low, don’t half quit on sermon shaping. Don’t just go with your study notes, but try to think through your audience and their needs, think through the best way to communicate this passage to them. When you go through the post-sermon emotional roller-coaster that many preachers feel so often, don’t half quit. Don’t make decisions that will undermine your subsequent ministry because of how you feel at that moment. When you are on the receiving end of unfair criticism or unjustifiable sniping, don’t half quit. Don’t steel your heart against the people you minister to so that by not loving them they can’t hurt you. When you love you get hurt, but love anyway. I’m not saying anything about rest, responsibilities with family, etc. I’m not saying sacrifice yourself to the point of burnout in an attempt to be spiritual. There are all sorts of appropriate balances to wisely employ in ministry. But those are for another post. All I’m suggesting here is that preaching is no easier than most other things you might pursue in life, and in many ways it is harder. To be the best you can be, to give the best you can give, you must be doggedly relentless. Don’t quit. And maybe more importantly, keep leaning on our good God and don’t half quit.